November, shortened days pass from gray to the rain without thinning hoped. One begins to dream getaways to sunny motorcycle. A holiday week blocked for a long time on the agendas of mid-December, the question is where to go? For us it’s simple we want Sun, scenery, roads to turns to maximum 3 hours of flights from Paris and without breaking the Bank. You think it’s impossible? And not at all! Looking towards the Atlantic, we have put the finger on an archipelago that seems to us the eye. The Canary Islands, since it is of them that he is, meet all these criteria and so much more. However, before you dig the idea we were blocked on the usual clichés of tourism there. Fortunately the Canarians have herded all the tourists in a small specific area because they keep the best for them. The Canary Islands are 7 volcanic islands, 7 nuggets on the Atlantic to a flight of a bird of the coast of southern Morocco: Gran Canaria, Tenerife, Lanzarote, Fuerteventura, La Gomera, El Hierro, and la Palma. 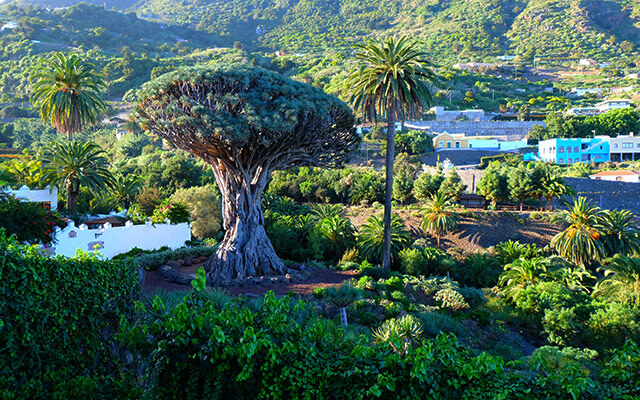 Our choice fell on Gran Canaria and Tenerife, the two largest islands of the archipelago who have plenty to seduce you and care you for a week. We land in Las Palmas, capital of Gran Canaria, in the middle of banana plantations, protected from the wind by kilometers of white sheets. It’s 9:30, a dazzling sun greets us, it is 25 degrees, not a cloud on the horizon and a blissful smile on our lips, who won’t leave us for the week. ½ hour bus later, we picked up the bikes and put the bags at the hotel and are ready to explore this treasure island. From morning to evening we travel the small winding roads of the island, not a straight line on the horizon. The modest size of our mounts multiplies our pleasure. This is not the speed that us gray but astonishment to see on the side of mountains, multicolored or white villages dozing under the tropical climate, to stroll through the streets of the village of Teror where a beautiful colonial district and its carved wooden balconies. Point need fast or powerful machines here. roads are so narrow that 500 or 600 cc motorcycles is more than sufficient and fluttering and will allow you to enjoy the scenery in cinemascope, which is offered to you at a good pace to cruise. As everywhere in the world the bikers have their focal point of Sunday. Sitting on the terrace sipping a beer well fresh we attend ballet frantic gleaming Belles to the Cruz de Tejeda, the crossroads and the hub of all the roads that come down to the coast. 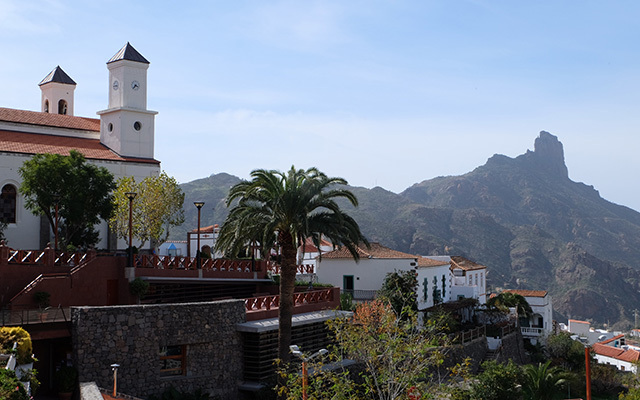 Tejeda, is also a beautiful village ranked among the most beautiful villages in Spain that offers an Observatory on Roque Bentayga, monumental rock worthy of the great American monoliths, who faced his counterpart the Nublo. By dint to skim all the roads we forget that we are on an island. 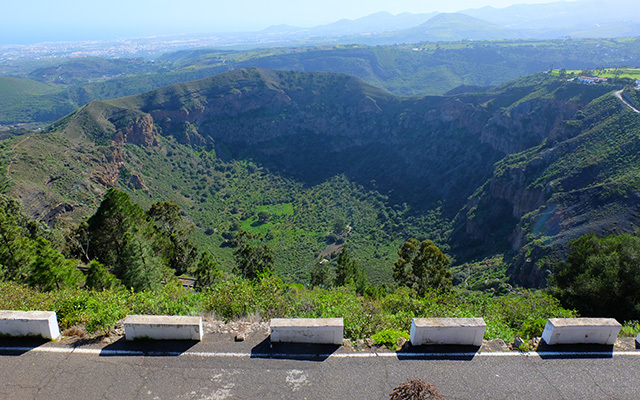 In 4 days, we traveled most of the small roads of Gran Canaria and even took the time to visit the Cenobio de Valeron, a native curiosity, a gigantic grain granaries clinging to a cliff and that resembles a big Morel. Now cap on Tenerife. The ferry waiting for us at the port of Las Nieves, charming small village by the sea away from the tourist bustle. 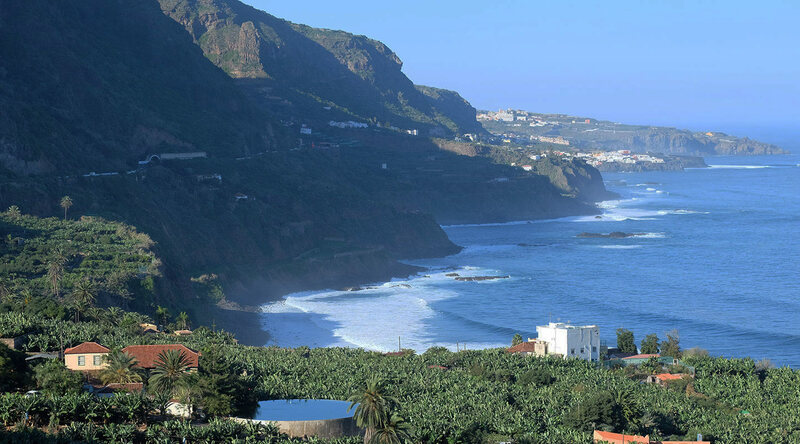 It is no less than an hour and a half of crossing to Santa Cruz, capital of Tenerife, festive and welcoming city. But it’s especially its neighbour, La Laguna, who won all the votes through its historic colonial class Unesco and its many palaces baroque to the ornate balconies. 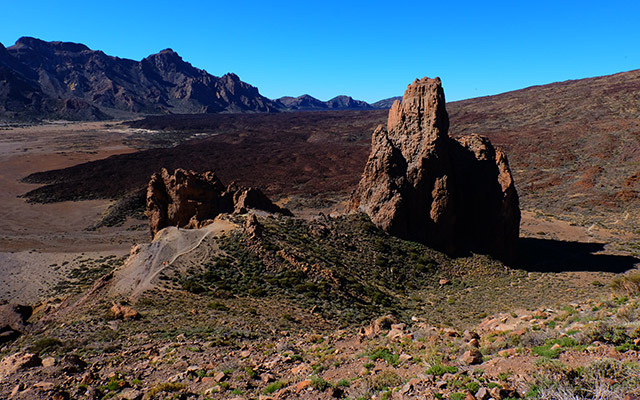 Early in the morning, departure for the peak of Teide and its 3715 meters, making it the highest point in Spain, from where a cable car propels us a few meters from the Summit, finally the days or there is not too much wind. Little by little, the forests, the road go on a barren Ridge. A few gliders soar and take flight in the foggy morning with, in the background, the cloudy silhouette of Gran Canaria. The landscape changes again, lava fields and rocky, very photogenic, concretions and the single straight line of the week. 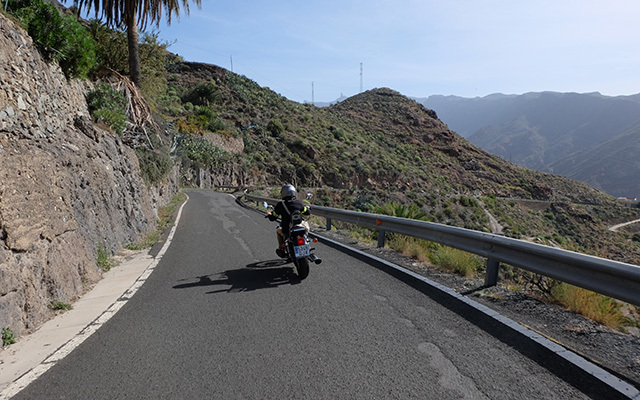 Then, on a net of gas, we chained the laces tight on a steep road to the village of Masca. We take the time to have lunch on the terrace of a small restaurant that overlooks this village, perched on a spur of rock and only connected to the road since 1960. Last laps before leaving Tenerife; photographing a majestic Millennium rider, this iconic tree of the island and pride of the small town of Icod los Vinos on the West Coast, take a last coffee on a lookout point facing the lined sea of banana plantation beaten by spray, history to capture the beauty of the landscapes encountered on our retinas. A magical week, surprise in wonder, a parenthesis that is sunny in the middle of December that we enjoyed so much that we have already planned to discover the other islands next winter and offer a circuit on the spot! 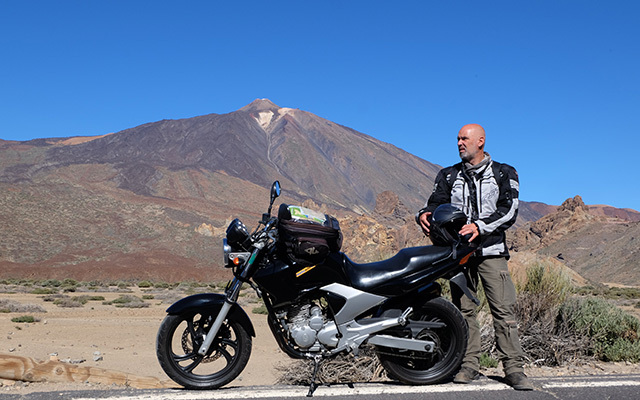 Passenger biker who dream of distant horizons, throw away your prejudices and go buy a plane ticket to the Canary Islands to live a concentrate of emotion and pleasure. Hurry up, there is not for everyone… ! You want to go on motorcycle travel soon? See what Planet Ride offers! 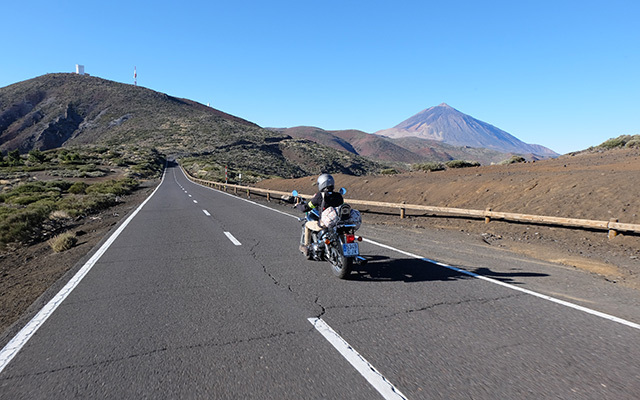 You want to make this motorcycle road trip to the Canaries? There he is!